Join us for an evening of exploring the field of genetics! We will learn about the genetics and effects of Huntington’s Disease through a sheep brain dissection. Each participant will collect a sample of their own DNA and create a DNA necklace. The event is FREE to middle and high school aged teens! Fun and food is provided, but seating is limited. To reserve spot, please contact McWane Science Center’s Reservation Department at (205) 714-8414. Our parking deck will be open for pick up and drop off. 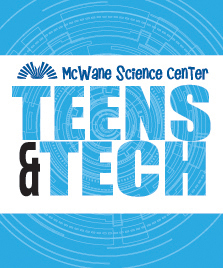 You may enter the special events entrance on level C.
The goals of “Teens and Tech” are to (1) engage teens in hands-on, technology-based learning experiences, (2) help them develop 21st Century Learning Skills (critical thinking, collaboration, creative problem solving) and (3) give them the opportunity to learn and practice technology-based skills. This program is made possible through the generous support of Best Buy.